Earlier this week, a mysterious ice sphere appeared above Polar Peak. 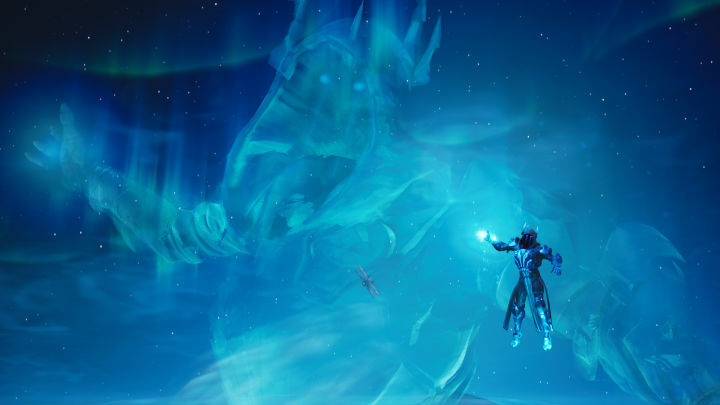 A silhouette of the Ice King, the final reward of Season 7’s Battle Pass, was visible inside. Television sets across the map began broadcasting a forecast warning with a countdown to today’s event. Bolts of lightning started to strike randomly across the map, leaving giant ice shards that summon Ice Legion monsters. Sound familiar? Last season’s Fortnitemare’s event followed a similar premise where Cube Fragments released Cube Monsters that could be killed for loot. Michael Koczwara is IGN’s Weekend Web Producer who would like to see weapons removed in the next event. Follow him on Twitter and YouTube.